Welcome to the Aft Cabin at Boonedocks on Oriental's Lower Broad Creek. 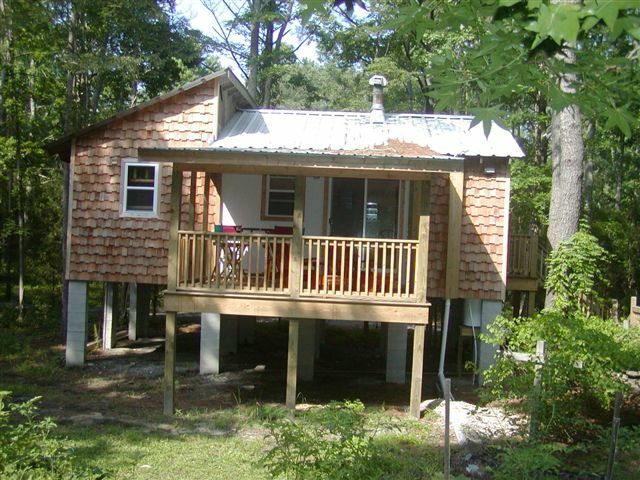 The Aft Cabin at Boonedocks offers a deep woods option for visitors to Oriental & Pamlico County. 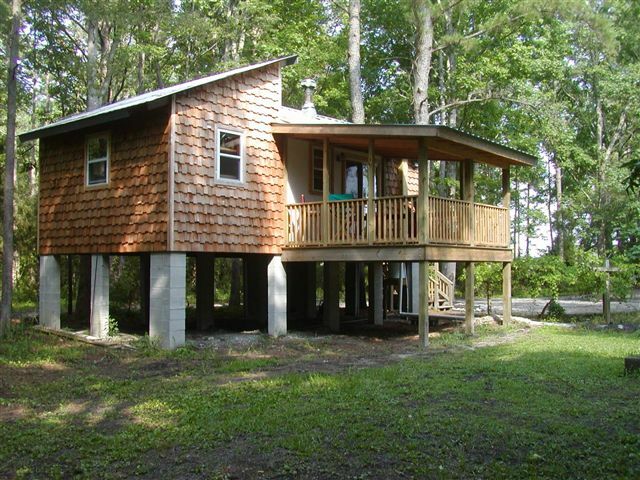 Beautiful Broad Creek and our docks are within view of the screened porch. 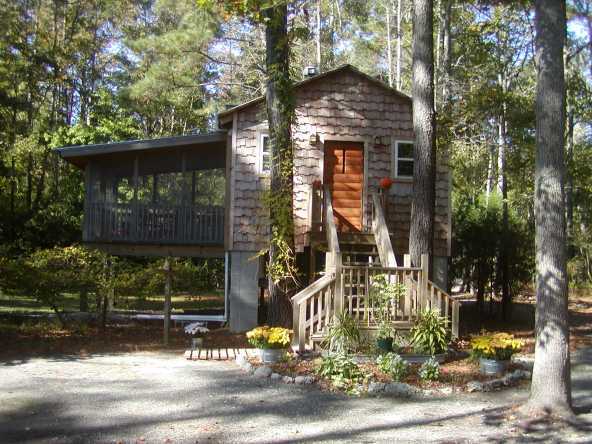 Whether you're visiting Oriental and Pamlico County for a vacation, shopping for real estate, or just touring to see the natural beauty of our area, following extensive renovation, we are pleased to offer our Aft Cabin to you for rental. A special note for north-to-south or south-to-north ICW passagemakers, your rental of the Aft Cabin includes the complimentary use of the dock car during your stay. Following the year-long renovation of the cabin, our "finishing touches" (a certain misnomer, as we continue to add "finishing touches" to the cabin all the time!) included creating a naturalized landscape plan that would make it easy for visitors to feel that the guesthouse was an integral part of its surroundings. On the left of this photo you can make out a grape arbor. In season, you are free to share our harvest of native grapes, as well as figs and seasonal vegetables (not pictured here). The cabin was never conceived as being a beach-style vacation home. 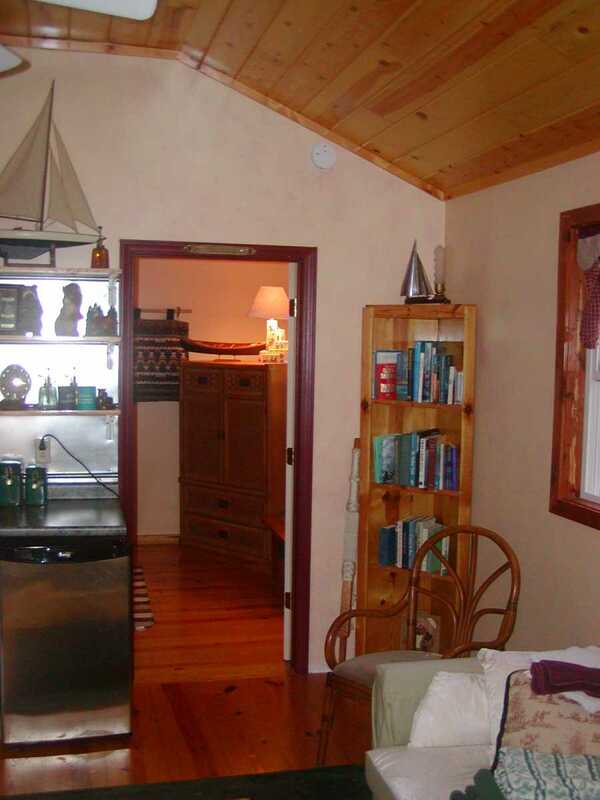 Instead, we opted for the clean, strong lines of a north woods cabin. The former grey panel cabin exterior was recovered using cedar shingles imported from Canada. We chose an offset shingling pattern to provide softness and contrast to the otherwise straight exterior lines of the structure. Beneath the cabin is storage space for our small boat fleet -- and enough left over for your canoe, kayak, or other small craft, too. Everyone loves the cabin - including critters! 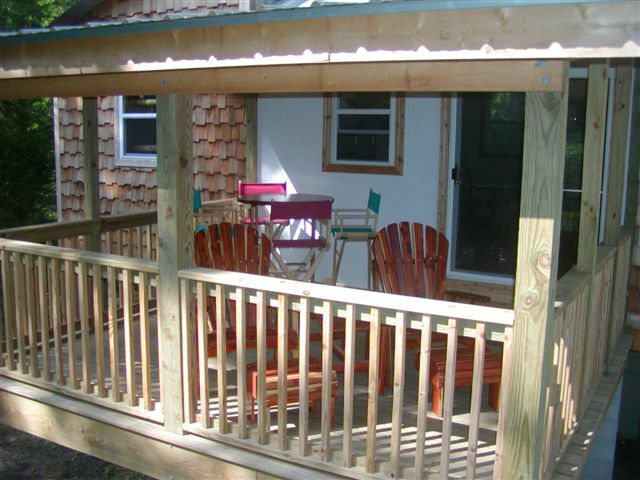 That's why we've screened the porch - to give you a comfortable outdoor water view without annoying pests. This photo shows the porch before the screen went up. The bistro table in the background is a favorite of our visitors. The tabletop is a 3/4-inch thick slab of eastern red cedar and the base is a Boonedocks Dockmaster original - copper pipe that is slowly developing the patina of aged copper. Smoking is not allowed inside the cabin, but an ashtray is provided on the porch for your convenience. No one will fault you for a smoke on the porch, we only caution you to be careful (as the old joke goes, "Ladies and Gents, you may smoke, just be careful where you lay your butts!) Your well-mannered pet is welcome on the porch, as well. We only ask that they be as careful with the screening as we know you'll be. Pictured here is the Aft Cabin Entertainment Center. Mounted above the eastern red cedar slab dining table (convertible for convenience, just lift up for room to square dance) is a 20-inch television with satellite feed. Below, on the table, is a AM/FM CD player, the very latest thing from TEAC (retro style - it just looks old!) for your listening enjoyment. Tall chairs (total four) work with this table or with the bistro table on the porch. We hope you never have a rainy day on Broad Creek, but if you find yourself with a little time on your hands, we've stocked the bookshelves in the Aft Cabin with apt nautical literature (a bunch o' boat books, edits the dockmaster!). Whether your passion is sailing or motoring, we have reading material suitable for all types of boaters. For kids of all ages on rainy days or cozy nights, an assortment of board games is provided. 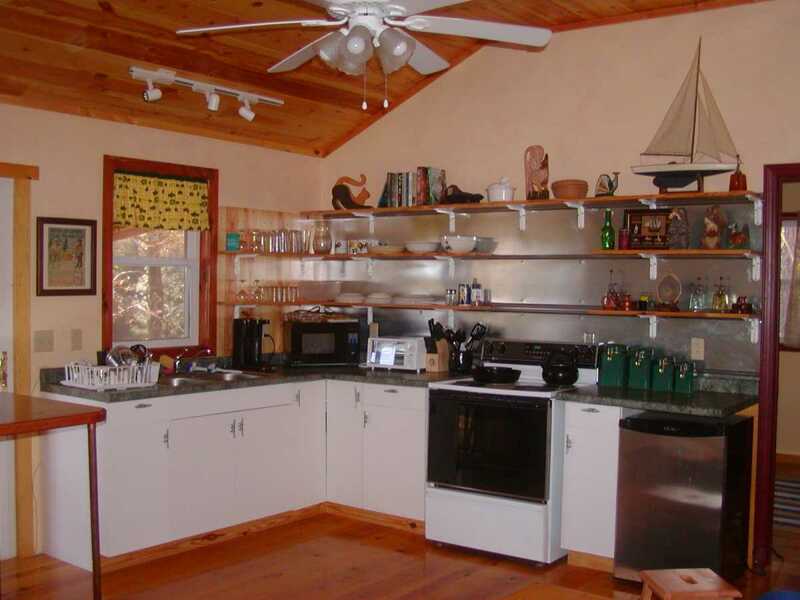 Entering the Captain's Quarters, the fully equipped kitchen is to the left and another bookcase to the right. Just through the door and in the bedroom, you catch a glimpse of an antique bamboo armoire. You may notice a few interesting lamps in this photo. We've made sure the cabin is well lighted for whatever task or relaxing pastime you have in mind. 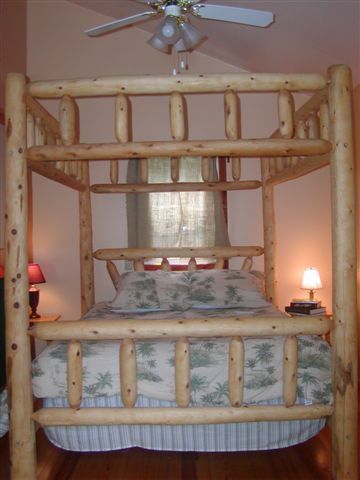 The star of the Captain's Quarters is a four-poster queen-size log bed. Enjoy any season with ceilng fan, zoned air-conditioning, and heat. The bedroom features a soaring roof painted in warm tawny colors and the long wall has a wainscotting of insulating quilt batting and color-coordinated fabric! A few visitors to the Aft Cabin arrived assuring us that they were early risers, even on vacation, and would certainly be up at the crack of dawn. The comfy Captain's Quarters, though, can overcome the best of intentions - those same visitors were seen finally emerging nearer noon! If you want to bound out of bed when the woodpecker pecks (Boonedocks' version of rooster crowing), set your alarm! The Captain's Quarters is just what the doctor ordered - if the prescription reads "good night's sleep." And, we supply the linens - cotton in summer, flannel in winter. Anyone can fall in love with this fully equipped kitchen. 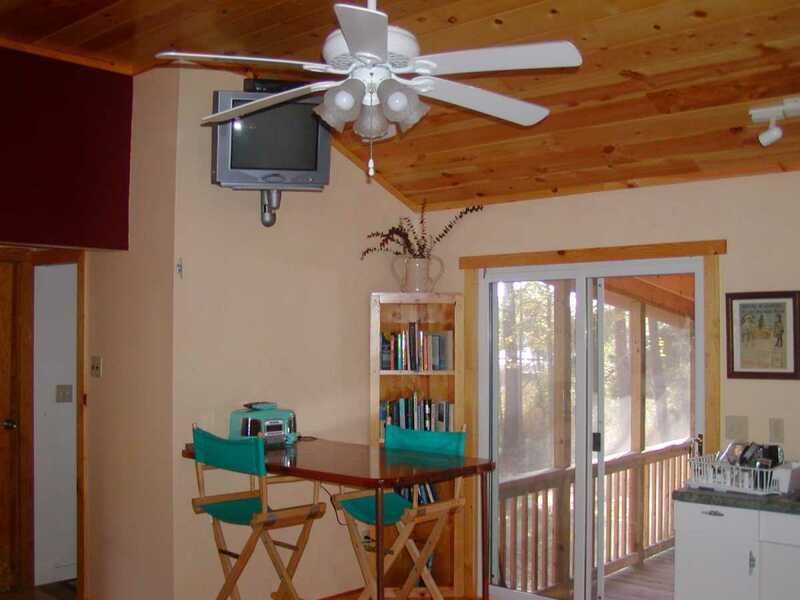 We provide a microwave, coffee maker, toaster oven, electric stove, and refrigerator. The Weather Gal loves all things John Deere - thus, John Deere place settings and servings bowls (and curtains, too) are included. We've tried to think of everything - wine glasses, pots, pans, drinking glasses, knives, flatware, wine opener, bottle opener, and all the little kitchen gadgets you'll probably need. If you plan on using the Aft Cabin as a test kitchen for your trial run at the Betty Crocker Bake Off, you'd better bring your own. Otherwise, we've got you covered - crab pot, too. The only thing we don't do is wash dishes - for washing up, you're on your own, but feel free to bring paper plates (we would!). 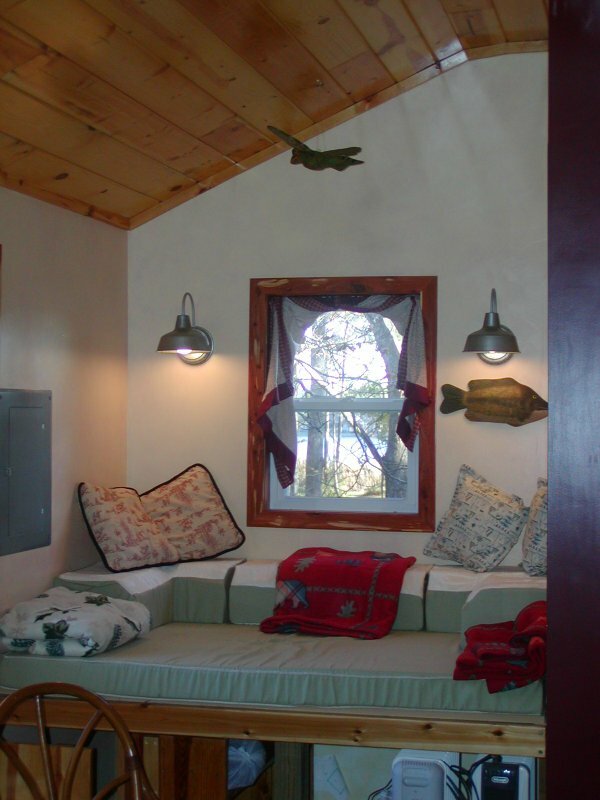 The reading nook offers a comfy curl-up spot and/or a bed for a child (or small adult). The platform is built at the right height to easily convert to a desk. If your goal is to get away for peace and quiet to work on a paper, project, or your great American novel, we provide high-speed Internet service via our bi-directional satellite link. Through the window, you'll have another nice view of the creek and can watch the wildlife that abounds at The Boonedocks. All boats are available to guests after a quick checkout by the Dockmaster. 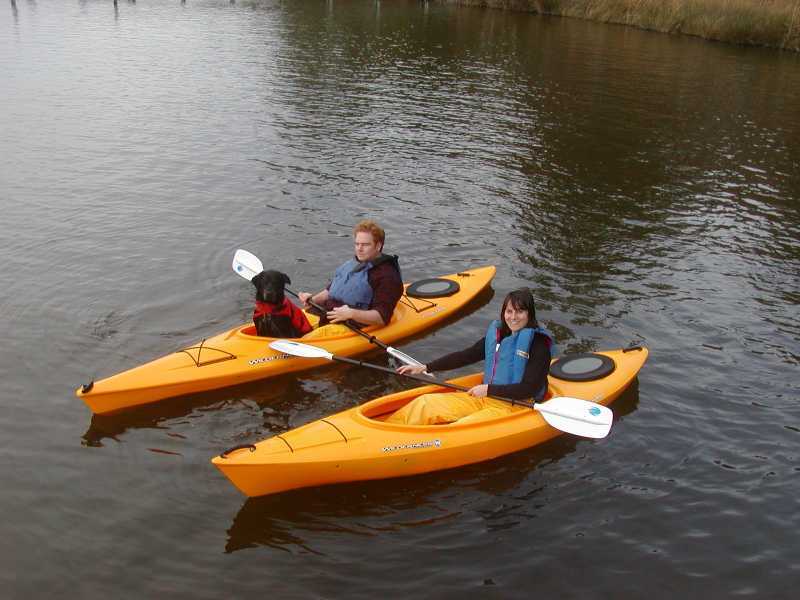 While we don�t consider this to be a rental fleet, there is a $10 daily fee for use of the boats. Ten dollars covers all cabin occupants for use of all the small boats for one day and is your �contribution� to our Sinking Fund (for the day a PFD doesn�t make it home, a paddle breaks, or a kayak has to be retrieved from the middle of the sound). Read more about the fleet. The Aft Cabin sleeps 2 or 3, or perhaps one more on an air bed, which we will provide upon request. If you have special requests or needs, please let us know - we can accommodate almost anything. 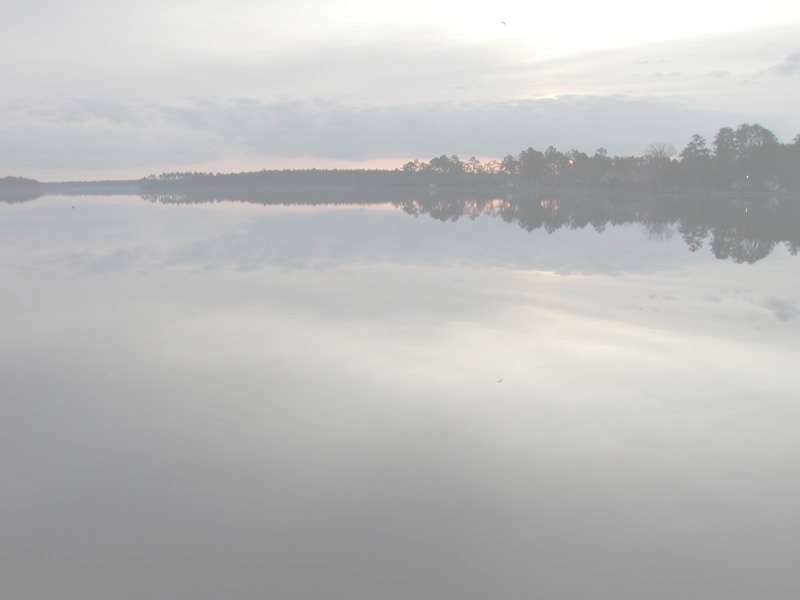 If you want to explore the paddle trails of Pamlico County, but you're not quite ready to go out on your own, please call us for suggestions regarding guide services - we have terrific paddling resources in the county. We know you'll find just the right match. Our goal for your visit is to make you feel at ease. The comment we hear most often from our guests is that they feel immediately "at home" when they walk through the door of the Aft Cabin. 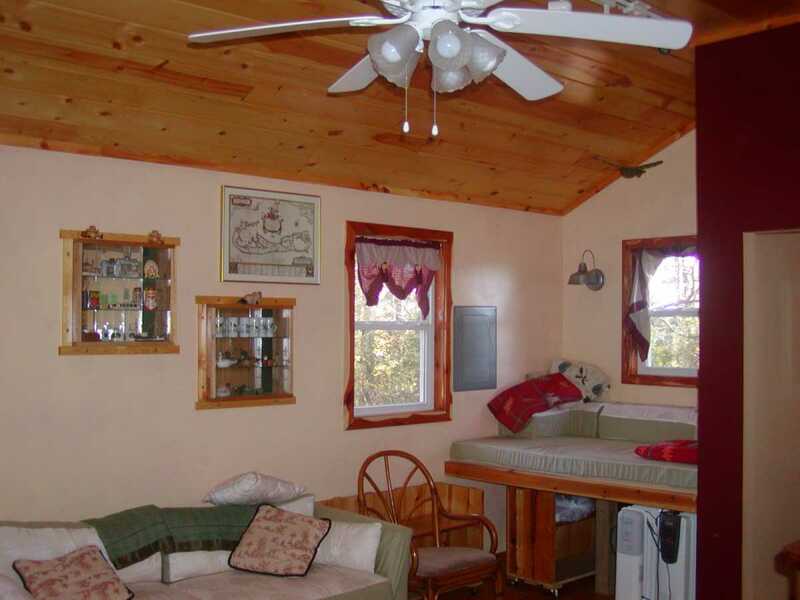 If your goal, though, is to find a real home of your own in the area, we think a stay at the Boonedocks will give you a solid feel for an area that we find irresistible. Call ahead, and we'll put you in touch with realtors who specialize in the unique waterfront real estate of Oriental and Pamlico County. Starting November 1 through February 28 (or 29, depending) and excluding Thanksgiving, Christmas, and New Year's; best rates shown in bold. Rates show are for 1-2 people; additional guests $10/person/day. Note: no unattended pets; crates may be available. Some flexibility can be had with check-in/check-out times, please ask us! Starting March 1 through October 31; plus Thanksgiving, Christmas, and New Year's.